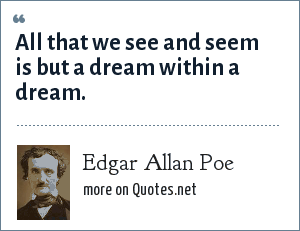 Edgar Allan Poe: All that we see and seem is but a dream within a dream. "Edgar Allan Poe Quotes." Quotes.net. STANDS4 LLC, 2019. Web. 18 Apr. 2019. <https://www.quotes.net/quote/3078>.